I didn't watch TV that much when I hit the age that your mom let you go out the house as a kid. What was that around 13,12? Back in the less danger days. The early 2000's. Better be home before the street lights. I started to break that rule more and more as I got older. Not even sure it was a rule for me after like 15. Anyways, because of my time outside of the house, I never really got to experience the greatness of some of the golden age of TV. That and I was young, my momma wasn't letting me watch HBO after 5pm. We once came home and I flipped on the living room TV and 'Six Feet Under' was on, Man, she flipped that channel so fast. So mostly anything in the early 2000's. I didn't see it. Thank god for HBO Go. In walks a show about a bald guy (his joke, he jokes about being bald. Hey, I'm nice) that co-created Seinfeld. The plots and subplots of the episodes are established in an outline written by David and the dialogue is largely improvised by the actors(a technique known as retroscripting). 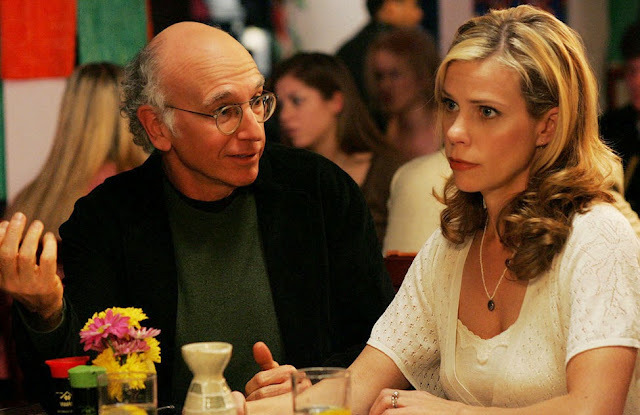 As with Seinfeld, the subject matter in Curb Your Enthusiasm often involves the minutiae of daily life, and plots often revolve around Larry David's many faux pas and his problems with certain social conventions and expectations, as well as his annoyance with other people's behavior. The character has a hard time letting such annoyances go unexpressed, which often leads him into awkward situations. I swear this show is really filled with some, many moments I go "That's something I would say". Take the 'Stop and Chat' for example. You see somebody out in public that you kinda know. Like a little bit. Not enough to be saying words to each other. Other then, 'Hey, how you doing". And they want to have a whole chat. Telling you see and that. You have no clue what they talking about. So you sit there looking awkward. I feel you Larry. I feel you. It's just little things like that, that makes this a show that you need to check out. It's now available on HBO GO and if you just want to pay the monthly fee, they have HBO Now. Give it a try. Click below to enter the App store.